Puzzlejuice is an amazing new game from Asher Vollmer for the iPhone and iPad that combines elements of word puzzle games with Tetris and new school touchscreen gameplay. You will not only be playing a block dropping game but also have to focus on your multitasking skills and challenge your vocabulary. Every once in a while an iOS game breaks new ground and delivers something ingenious, and Puzzlejuice is definitely going to leave a lasting impression. This game is on sale right now for 99c so be sure to grab it, especially if you love brain tease style puzzlers. The concept in the Puzzlejuice game is pretty simple. You slam blocks of colored boxes down as they drop to form a solid line. That’s where the Tetris similarities end because a filled line doesn’t automatically get removed from the board. Here’s where the word puzzler part of Puzzlejuice kicks in. As soon as a full line has been formed the colored boxes turn into white boxes each containing a letter. Then you have to drag your finger across these letters and form word to remove them. If this sounds intense, its because it is. You’ll be concentrating on finding words to spell while you’re rotating and lining up falling blocks. If you get overwhelmed you can try the local multiplayer feature in Puzzlejuice where 1 player spells words and the other manages the blocks. Now if that wasn’t enough of a brain strain in Puzzlejuice you can also match colors. After each game you see your list of words along with the final score, “hi combo” and “the sweetest word”. You also get a rating for your effort level and can tweet your results. On this screen you can double tap on any word you spelled during the game to see its definition in the iPhone dictionary. 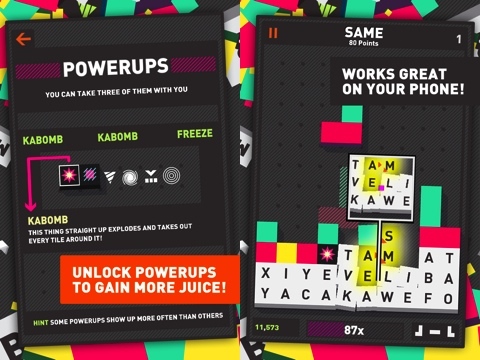 Puzzlejuice can be played in 2 modes: Core Mode or Zen Mode Extreme. In Core Mode you go against a never ending block dropping party and see how long you can last. You have objectives to complete along the way such as finding a 5 letter word. Make sure to finish those objectives which reward you with up to 6 powerups that make the game easier for you. Core has 2 difficulty levels to choose from. Start with Hard Mode to get used to the game. Hard mode is actually is easier than the other mode since adjacent blocks explode when you spell any word. When you get better with spelling move to the Euro Extreme mode where you need to spell 5 letter words to blow up adjacent blocks. Zen mode extreme is a 90 second game great for playing a quick game when you only have a quick minute or two to waste. The game is not without issues however. On the iPhone, it can be hard to spell out words if you don’t have small fingers due to the smaller screen size. Since in Puzzlejuice you can spell words in any direction (up/down/left/right/diagonal) it takes a few tries until you get the hang of how you’re supposed to do it. The game does help you by showing a magnified view of the place where you’ve placed your finger. Dragging diagonally takes some getting used to. Thanks to the larger screen on the iPad you won’t have to struggle as much when spelling words. The other issue is the lack of online multiplayer. It would be really fun if you could play the same local multiplayer game with friends on Game Center. 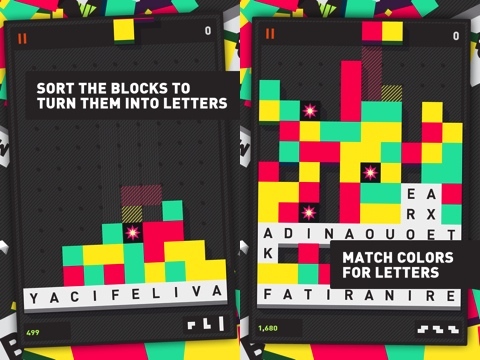 Overall, Puzzlejuice will mess you up in a good way. It’s amazing soundtrack music alone is reason enough to grab this game. The minimal style pastel colored graphics are fun and inspiring. You’ll spend a ton of time playing Puzzlejuice and perhaps find out if you can squeeze more juice out of your brain than you thought you could. We’ve given Puzzlejuice the Featured App award, and without question it deserves that and a whole lot more. Update: Puzzlejuice app developer has published a blog post that reveals how the game was thought out and developed along the way. There are all of 365 juicy emails to go through. If you’re in the beginning stages of making an iPhone app yourself, you maybe able to get ideas, or use some of these steps as inspiration or guidance in house. AppSafari review of Puzzlejuice was written by Joe Seifi on January 21st, 2012 and categorized under App Store, Featured, Games, iPad apps, Line Drawing, Puzzler, Universal, Word Games. Page viewed 4983 times, 2 so far today. Need help on using these apps? Please read the Help Page.